Two San Francisco gun laws will stay in place despite an appeal by the National Rifle Association, the U.S. Supreme Court decided on Monday. 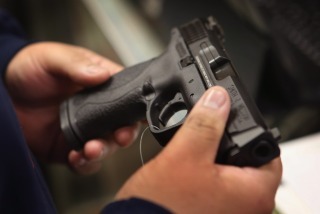 At issue were San Francisco's measures preventing the sale of hollow-point bullets and requiring handgun owners to use trigger locks or keep their weapons locked when not in use. "The record contains ample evidence that storing handguns in a locked container reduces the risk of both accidental and intentional handgun-related deaths, including suicide,” Ninth Circuit Judge Sandra S. Ikuta wrote in the court’s upholding opinion in March 2014, reported Al Jazeera. "Based on the evidence that locking firearms increases safety in a number of different respects, San Francisco has drawn a reasonable inference that mandating that guns be kept locked when not being carried will increase public safety and reduce firearm casualties." Only Justices Clarence Thomas and Antonin Scalia would have heard the appeal, which was filed by the NRA in conjunction with seven other plaintiffs, according to NPR. Joined by Scalia, Thomas filed a six-page dissent. "Because Second Amendment rights are no less protected by our Constitution than other rights enumerated in that document, I would have granted this petition," Thomas wrote.